Since it’s another slow news week and I haven’t had a lot to talk about, how about something a bit different? I ordered a couple of Halo books – one new, one a few months old now – a little while back and finally got the chance to read through them recently. 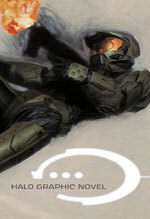 The fourth Halo novel and the third by Eric Nylund, Ghosts of Onyx is an attempt to fill in some of the blanks (some would say plot holes after Halo 2) left by the previous books and, hopefully, set up certain events for Halo 3. Chronologically, it’s set partly before the original game, but mainly runs concurrently with the latter stages of Halo 2. Overall I felt much the same way about it as I did about the previous novels. 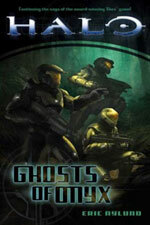 Ghosts of Onyx is fairly entertaining enough and a good read for fans of the game looking for a quick story fix, but ultimately a bit of a typical trashy sci-fi novel. Everyone speaks in technobabble (it’s not a rocket launcher; it’s an M19 SSR SPNKr rocket launcher) to the point where talking about technology often becomes a monologue, and the characters can seem like one-dimensional military stereotypes. That might be intentional due to the nature of the Spartans (read The Fall of Reach or the ever-reliable Wikipedia entry) but when most of them have never even been referenced in the games and do little other than fight – sometimes with a SRS99C-S2 AM sniper rifle, naturally – it can be difficult to empathise. And yet, despite these flaws, I found it hard to put down until I’d finished it. It’s not a bad book; just, like I said, a bit trashy sometimes. Nylund is clearly very good at writing action, and coupled with a universe as interesting as Bungie’s it’s certainly a fun read for fans. Just don’t expect a work of great literature, OK? It’s just an extra helping of Halo. Much was made of this when it came out as Bungie partnered with Marvel and a selection of prominent artists to bring their universe into yet another media. It was popular, too: we asked about it in a big Australian comic shop back in August and they said that they were selling out even their largest shipments in hours. It’s definitely an attractive book – hardback, with a lovely painting of the Master Chief spread across the two covers – and while the artwork ranges considerably in style it’s all definitely Halo. Recognisable characters and enemies all make appearances, never deviating far in their look from what the games have shown us. And in addition to the four stories here, there’s a gallery section with some wonderful paintings of scenes from the series, from both Bungie and Marvel’s artists. Unfortunately, I didn’t think too much of the stories themselves in the HGN. Most of them aren’t as fleshed out as they could be and, in particular, one of them seems to contradict what has been said in the novels, making one (or indeed both) of them non-canonical. It’s a really geeky criticism, I know, but a lack of continuity in stuff like this is a bugbear of mine. Then again, Bungie is supposed to have overseen the stories for both, so maybe they can be reconciled. We’ll see later this year. Whether the stories are particularly strong or not, the HGN is still a worthwhile book for fans. I’m happy I got it for some of the gorgeous artwork alone and, in my case at least, that’s the main reason to read a graphic novel. Previous PostMy 360 Endures…Just AboutNext Post20GB PS3: Why the Hate?